This is an article published in our February 2018 Issue. During its biennial overseas exercise, Forging Sabre, the Singaporean Armed Forces used enhanced C2 to further integrate fast jets, attack helicopters and UAVs into the precision, and simultaneous delivery of kinetic munitions. The Singapore Armed Forces (SAF) recently concluded its latest air-land strike integration and live-fire exercise which was carried out from 28 November to 13 December 2017 in the dry and dusty expanse of the Barry M Goldwater Range (BMGR) in Arizona, in the United States. This biennial overseas exercise, codenamed Forging Sabre, was the sixth and largest iteration to date since the exercise series began in 2005. It brought together 800 personnel from the Republic of Singapore Air Force (RSAF) and the Singapore Army to fine-tune operational planning and execution processes, as well as conducting joint live-fire training. “This exercise provides an excellent opportunity for the SAF to validate its integrated strike capabilities through the conduct of dynamic strike missions,” said Brigadier General Tommy Tan, commander of the RSAF’s Air Combat Command and director of Forging Sabre 2017. He also revealed that the latest exercise made use of a significantly larger area of the BMGR facility with a total area of approximately 780km² in size, in addition to the usual 300km² live range employed in previous visits, injecting an increased level of complexity for participating troops. 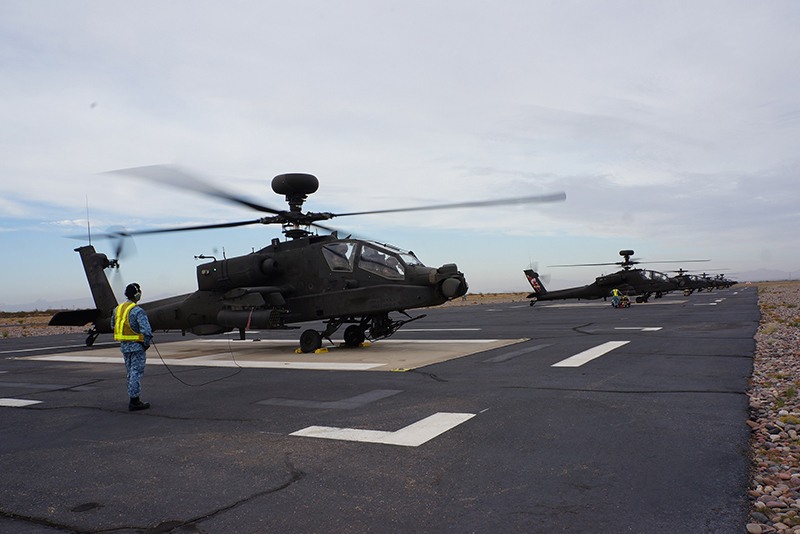 According to the Singapore Ministry of Defence (MINDEF), the RSAF deployed six Boeing AH-64D Apache attack helicopters from the Peace Vanguard detachment at Silverbell Army Heliport in Marana, Arizona; 10 Boeing F-15SG multirole combat aircraft from Peace Carvin V at Mountain Home Air Base in Idaho, and 10 Lockheed Martin F-16C/D multirole combat aircraft from the Peace Carvin II detachment at Luke Air Force Base. Support elements comprised three Boeing CH-47D heavy-lift helicopters from the Peace Prairie detachment at Grand Prairie Army Aviation Support Facility in Texas, which were deployed for combat search and rescue (CSAR) and commando insertion missions, as well as three Israel Aerospace Industries (IAI) Heron 1 medium-altitude long-endurance unmanned aerial vehicles (MALE UAVs) providing reconnaissance and targeting support to the air and ground strike assets. The Heron 1 UAVs were declared fully operational in March 2017 and are operated by the RSAF’s 119 and 128 squadrons. The first was introduced by the service in May 2012 as a replacement for the ageing fleet of IAI Searcher tactical UAVs that entered service in the mid-1990s. Measuring an overall length of 8.8m with a wingspan of 16.6m, the air vehicle has a maximum take-off weight (MTOW) of 1,100kg and a payload capacity of 250kg. According to MINDEF, typical mission systems include an electro-optical infrared ball turret and a laser designator. “The Heron 1 can be deployed with fighters and attack helicopters, amplifying the SAF’s precision strike capabilities,” said defence minister Ng Eng Hen. “Apart from these conventional operations, it can also be deployed against terrorist threats, because its persistence enables it to cover a wide area of surveillance,” he added, referring to its ability to stay aloft for as long as 24 hours in a single mission. MINDEF also revealed that as many as 150 precision munitions were expended in day and night training missions during the two-week exercise. These included the Lockheed Martin AGM-114L Longbow Hellfire radar guided air-to-ground missiles, GBU-10 and GBU-12 Paveway II laser-guided bombs (LGBs), GBU-31 and GBU-38 Joint Direct Attack Munitions (JDAMs), and GBU-54 Laser JDAMs (LJDAMs). In particular, the use of the 2,000 lb-class GBU-31 JDAM at Forging Sabre 2017 marks the first time the precision bomb has been employed in an SAF live-fire exercise. The weapon was recently introduced into RSAF service with first launch occurring during the USAF’s Combat Hammer air-to-ground weapons evaluation exercise at the Utah Test and Training Range maintained by Hill Air Force Base (AFB) in May 2017. 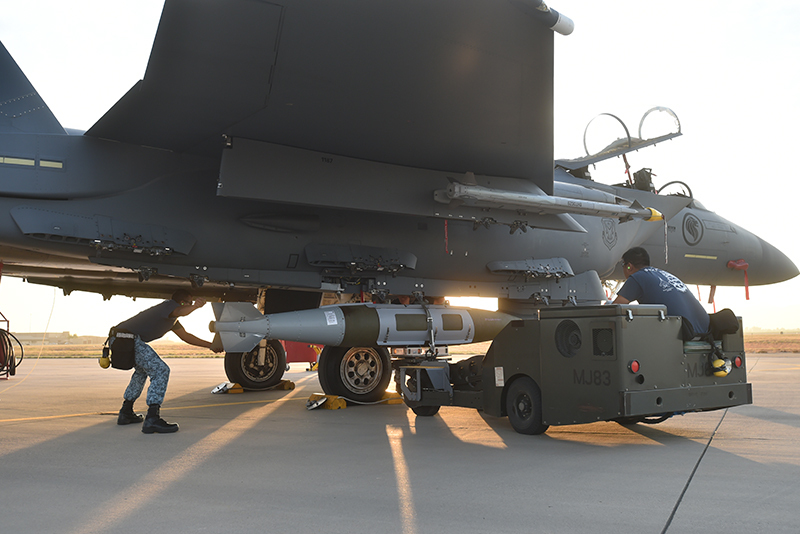 Singapore acquired 913 KMU-556B/B JDAM kits for Mk-84 2000 lb bombs, 100 FMU-152A/B fuzes, and 300 DSU-40 Precision Laser Guidance Sets via the US Foreign Military Sales 9FMS programme along with associated parts, logistical support, as well as training under a $63 million deal approved by the US government in 2014. As one of the largest air-launched precision guided munitions in the RSAF’s arsenal, the GBU-31 enhances the ability of the service’s Boeing F-15SG and Lockheed Martin F-16C/D combat aircraft to destroy large or heavily fortified structures. Other known precision munitions employed by Singapore include the GBU-10 Paveway II Laser Guided Bomb (LGB), GBU-12 Paveway II LGB units, and GBU-38 JDAM. The SAF also took the opportunity at Forging Sabre 2017 to test out new enhancements to the networked command and control (C2) system that had been developed specifically to support the exercise series. The bespoke C2 system is a joint effort between the armed forces and the country’s Defence Science and Technology Agency (DSTA), and is also used as a platform to trial new technologies that could eventually be applied to its operational systems. Development of the system was initiated in 2009 and it has continuously improved inputs from operators and technological advancements in software and military hardware. Acting as the central command node for the exercise, the C2 system supplies an integrated battlefield picture to commanders. By fusing information from disparate sources – such as special forces troops, army reconnaissance teams known as the STrike ObserveRs Mission (STORM), as well as aerial assets such as the Heron 1 UAVs – the C2 system is designed to reduce the overall sensor-to-shooter loop for SAF units on the field. For example, the system provides real-time updates of the ground situation picture by overlaying high-definition live video feeds from the Heron 1 UAVs onto an augmented reality display. Using advanced graphics rendering techniques, geographical data such as landmarks, roads, buildings, and vegetation are superimposed on the feed, which is then exploited using video analytics technology to automatically derive target locations onto the display. This reduces the cognitive load of operators, enabling them to quickly orientate to the latest ground situation picture for timely decision making, as well as improving their ability to monitor multiple targets. DSTA also highlighted that the set-up time for the C2 system was also cut down from weeks to just days by incorporating new server virtualisation technology. This enabled its engineers to replace bulky physical servers with virtual systems, which reduced the overall server footprint bringing savings in power, cooling and space requirements. With its modular architecture, the C2 system can also be expanded with other training systems such as the Army Warfare Simulation System, which allows exercise planners to incorporate ground-based scenarios and assets into training scenarios without requiring actual troops or vehicles. 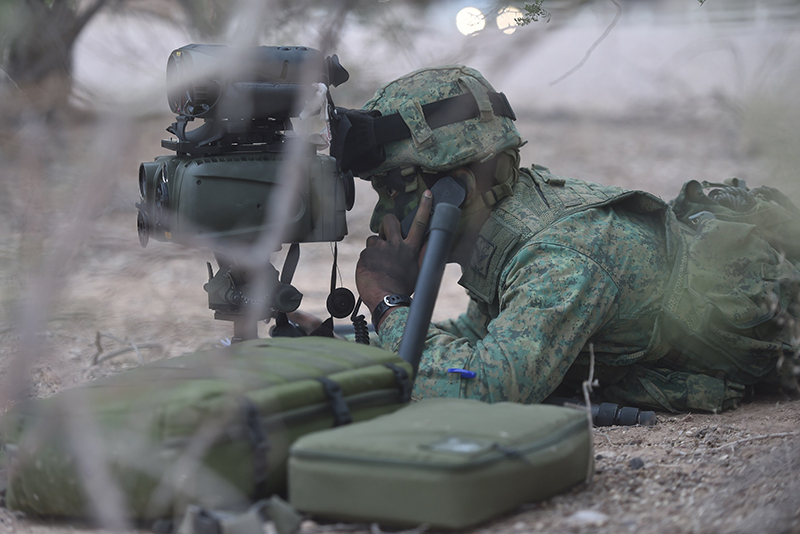 The Singapore Army’s STORM teams, which comprise of specially trained reconnaissance troops who direct the action of SAF air or artillery assets from forward positions, have benefited from a new ground designator that replaces the venerable Laser Target Marker (LTM-91). Supplied by local electro-optics firm STELOP and introduced in late 2016, the new Target Acquisition Designation System (TADS) integrates the high-definition Day Night Ranging System (DNRS) with Elbit Systems’ PLDR III long-range portable lightweight designator/rangefinder. The DNRS features a Class 1 laser rangefinder as well as a high-definition thermal imager, which is affixed on the PLDR-III and enables STORM troopers to acquire target ranging information at distances of up to 5 km at night, while the latter is equipped with a Class 4 laser target designator/rangefinder that has an effective range of 10 km, double the range of the LTM-91. TADS weighs around 10 kg as a complete system – which is about 40 percent lighter than the LTM-91 – and also offers a 20 percent increase in runtime. The army’s artillery formation also unveiled the new Battery Command Post, which has been specifically developed to improve the effectiveness of its Lockheed Martin-built M142 227 mm High Mobility Artillery Rocket System (HIMARS) platforms on the field. The new command post is based on a 4×4 MAN truck chassis and is operated by a crew of eight personnel. It is equipped with an on-board power supply that supports a suite of software-defined radios as well as an optional satellite communication (SATCOM) capability, which when combined with its automated antenna masts, enables its crew to perform on-the-move command and control. 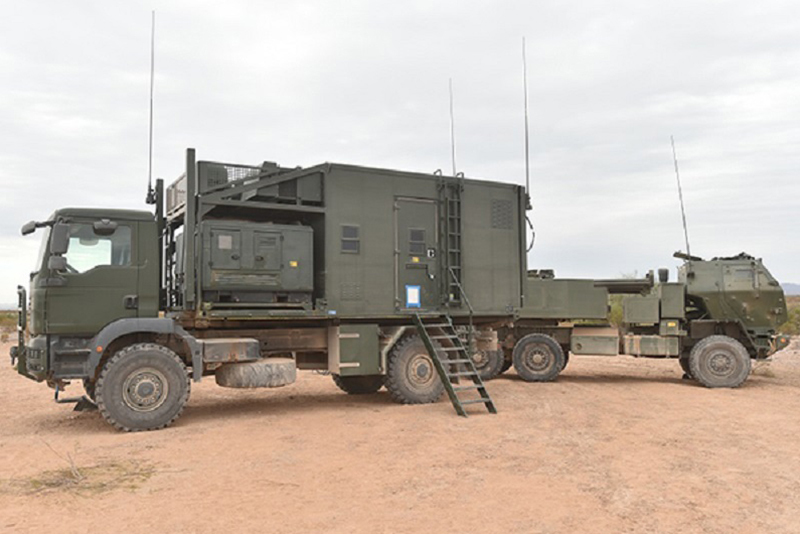 According to media reports, the battery command post is networked to platoon-level command posts and their respective launcher units via the Army Battlefield Internet (ABI). The ABI is a system connecting all computers used by ground forces and forms the backbone of the army’s battlefield communications network. It was also reported that the indigenously developed Battlefield Management System (BMS) – which enables blue-force and red-force tracking as well as receive real-time situational awareness and targeting updates from reconnaissance assets – is also expected to be integrated in the near future. The command post is outfitted with two integral power generators, which can provide continuous power for up to 48 hours, and four deployable antennas that are electronically raised or lowered from within the command cabin. Set up and tear-down is fully automated and does not require the vehicle to come to a halt. Previously, personnel had to dismount to unload and set up a portable power generator which would have taken as long as seven minutes to complete. In contrast, the new command post can be fully deployed within four minutes, increasing the crew’s survivability. “The new battery command post enables us to process information and shoot faster,” said Colonel Michael Ma, the army’s chief artillery officer and the land director for the exercise. “One of the advantages that it brings is that it enables us to command on the move…this means that I don’t need to stop; I can fight as I move and ensure that my range is continuously maximised and that we keep up with forces that need our support,” he added. Each launcher – which is operated by a three-man crew comprising a detachment commander, a gunner and a driver – is armed with the M31 GMLRS pod, which carries high explosive unitary rockets that have a maximum range of 70 km, and feature GPS-aided inertial guidance that enables the rockets to achieve a hit probability of around 15 m circular error probable (CEP) from their aimpoints. Singapore’s HIMARS launchers are also equipped with BMS and is fully connected to the platoon and battery level command posts as well as STORM teams that have been deployed. Lieutenant Colonel Jackson Tong, commanding officer of 23rd Battalion, told reporters that HIMARS operators were previously required to recalculate firing orders and lay on the target separately for each of the launcher’s complement of six rockets. However, with the installation of UFCS, the operators can now input specific aimpoints for each rocket, which effectively enables each launcher to engage six targets simultaneously. According to Lockheed Martin, the UFCS is an evolutionary block upgrade that enhances the existing MLRS Fire Control System and enables the use of Guided Multiple Launch Rocket System (GMLRS) munitions that incorporate anti-jamming technology. In a first for the Forging Sabre series, the army’s HIMARS operated in the same battlespace with the RSAF’s Heron 1 UAVs, exploiting the latter’s persistent surveillance as well as laser targeting capabilities for greater effects.